Dr. Scholl's® For Her Cozy Cushions are like like teddy bears for your feet! They are warm, soft and little cuddles for your feet! These are made for winter wear-if it's not cold out your feet WILL sweat:) They can be a little hard to get in your boots and the thickness can cause your shoes to be a little tight. Overall I have really enjoyed these-no cold toes for this girl this year. That being said, I was thrilled to receive a complimentary pair of Dr. Scholl's® For Her Cozy Cushions from Influenster in the RoseVoxBox. 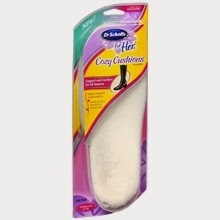 Dr. Scholl's® For Her Cozy Cushions™ help keep feet warm and dry while providing all-day comfort. Their multi-layer design helps insulate the foot while two plush layers provide extra cushioning. Cozy Cushions help keep feet dry by absorbing perspiration and offer superior comfort. I received this product complimentary from Influenster.